This is a great adventure for those that want to have some white water excitement as well as some up close and personal time with nature. We combined our 1 day rafting adventure with Trek #1 to give you a 2 day adventure with a overnight stay in a real hill tribe village. You get some adventure, culture, and nature! We will meet up at Pai Adventures office at 08.00 in the morning. If you need to be picked up from your lodging we can accommodate. We will load everyone up in to our brand new truck and drive 3 miles to our storage area to be fitted for helmets and life jackets. We will then drive 1.5 hours to the insertion point on the Khong River. There you will get to hand feed a family of wild Gibbons alongside the river. Then you will receive a safety briefing and boating instructions. You will finish your rafting trip at the Mae Hong Son Forestry office where you will get to take a shower and change clothes. From there we will drive 1 hour to the beautiful Luk Khao Lam village where you will be treated to hill tribe hospitality. Socialize with the guide and his family while they prepare your meal. Afterwards get some sleep because after breakfast in the morning you set off on your trekking adventure. * Any extra gear you may have can be stored in our office under lock/key and CCTV. 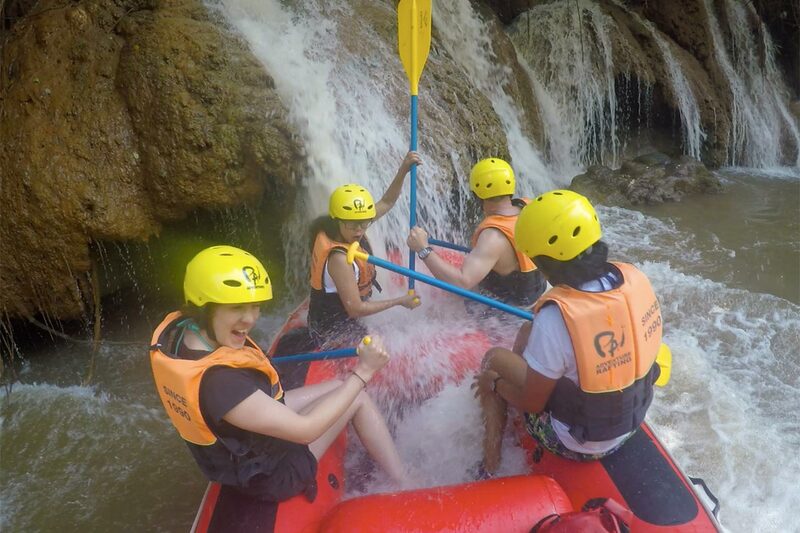 Due to other bookings we may have you go trekking or rafting on day one. We will let you know when you confirm booking and pay. Want adventure and love to trek? We combined our 1 day rafting adventure with Trek #2 and Trek #3 to give you a 3 day adventure with a overnight stay in a real hill tribe village as well as tent camping near beautiful Suza Waterfall. 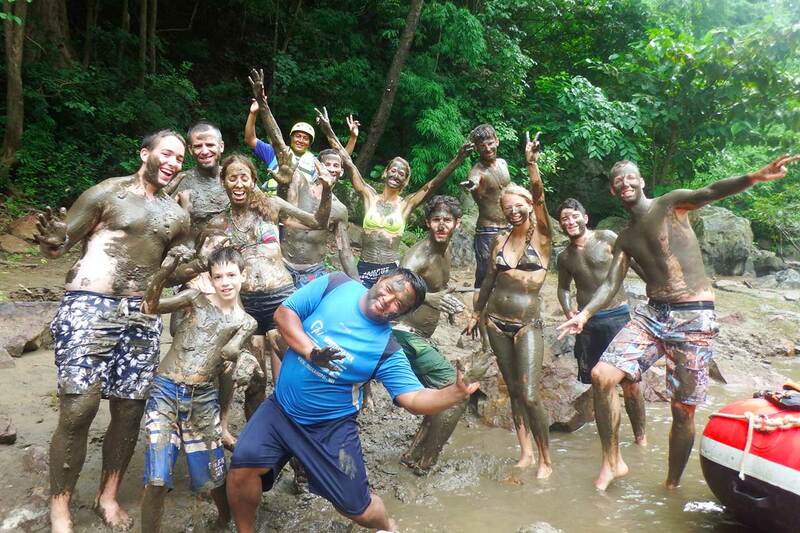 You get some adventure, culture, camping in nature, and of course a lot of trekking! We will meet up at Pai Adventures office at 08.00 in the morning. If you need to be picked up from your lodging we can accommodate. We will load up and drive drive 3 miles to our storage area to be fitted for helmets and life jackets. We will then drive 1.5 hours to the insertion point on the Khong River. There you will get to hand feed a family of wild Gibbons alongside the river. Then you will receive a safety briefing and boating instructions. You will finish your rafting trip at the Mae Hong Son Forestry office where you will get to take a shower and change clothes. 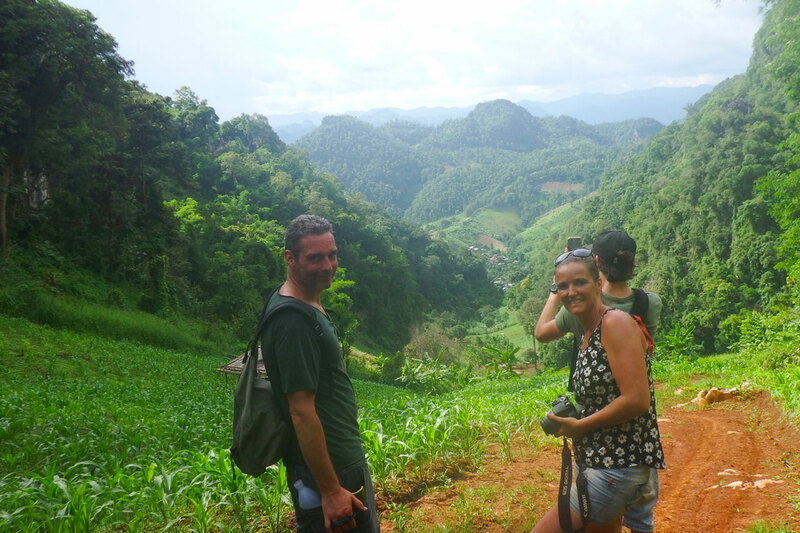 From there we will drive 1 hour to the beautiful Luk Khao Lam village where you will be treated to hill tribe hospitality. Socialize with the guide and his family while they prepare your meal. Afterwards get some sleep because after breakfast in the morning you set off on your 2 day trekking adventure. All transportation to and from adventure, all equipment (international standard helmet, paddles, and life jackets), food/water, licensed guide, park fee, and insurance. 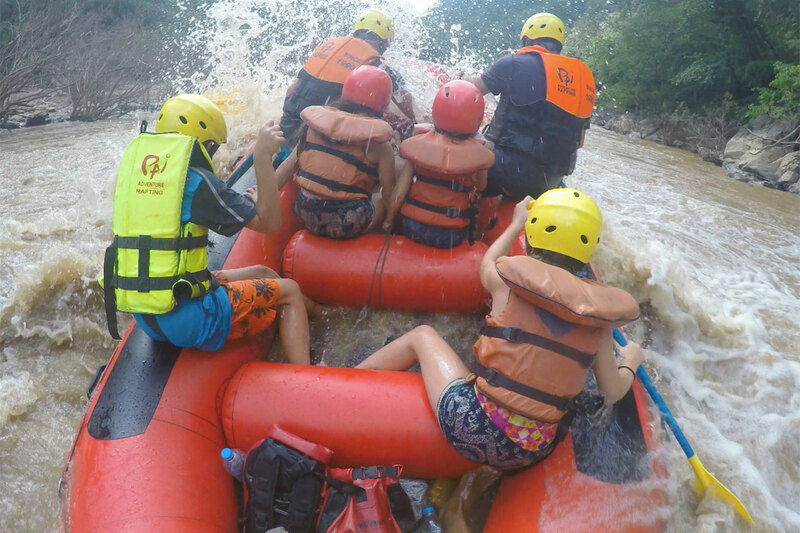 Due to other bookings we may have you go trekking or rafting on day one. We will let you know when you confirm booking and pay. 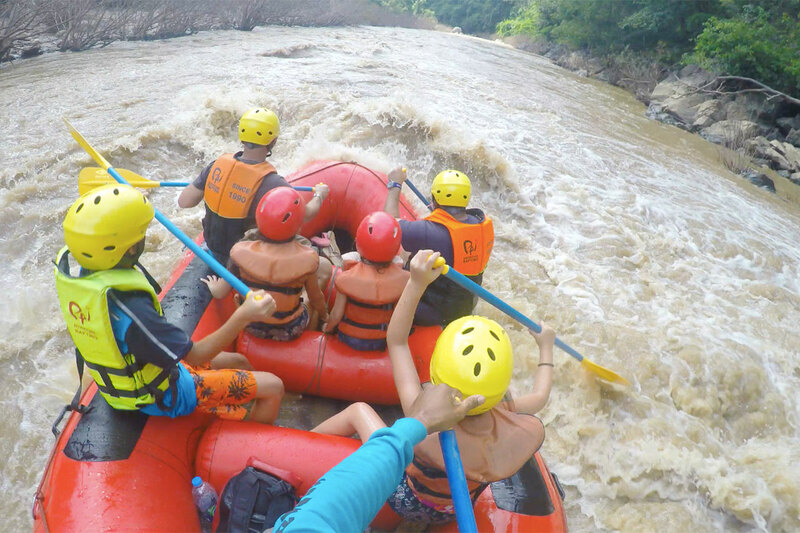 For those that want to have the full rafting experience and a nice day of trekking we have combined our 2 day rafting adventure with Trek #1. You get to stay the night in our jungle camp and a night in the hill-tribe village experiencing hill-tribe customs and hospitality. We will meet up at Pai Adventures office in the morning and depart shortly after. We will drive about 1 hour out of Pai through amazing farmland that meets up with the edge of the jungle. Alongside the river we will give a safety briefing and paddling instructions before we set off on the adventure. We will float through the lazy waters winding its way through the mountains. After a couple of hours we will find a spot to sit alongside the river and eat lunch. After lunch we will set of again and enjoy exciting rapids until we reach the path to our hidden waterfall. 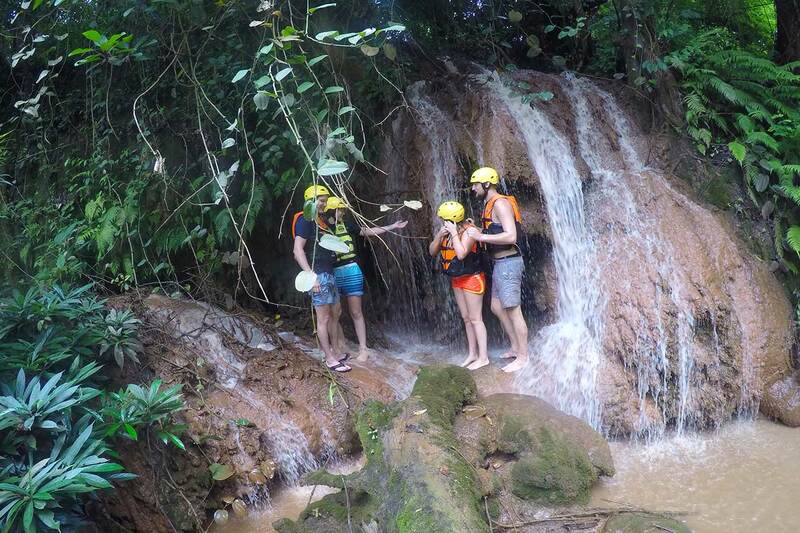 We will take you on a short trek to a pristine waterfall where you can enjoy a waterfall massage and soak in its pool. We will load back up in the boat and enjoy more rapids. We will stop off at the waterfall rockslide for some fun. After everyone has slid down the rockslide a few times we will load back up and navigate some more rapids. We will then tie up the boats at our campsite location deep in the jungle. The guides may ask for your assistance in setting up the tents inside the bamboo structures. As you are drying off, changing clothes, and getting comfortable the guides will begin preparing dinner for the night. During and after dinner you can sit around the campfire and enjoy your amazing surroundings. Your guide who has breakfast waiting to be served will wake you up. While you are enjoying breakfast the guide will begin breaking down camp. After you finish breakfast he will ask for your assistance in taking down the tent. After everything is packed away you will set off for more fun on the river. After a few sets of rapids we will hit a slower section until we reach the hot springs. There we will serve lunch. After lunch you will float through 15 sets of rapids up to class 3-4. 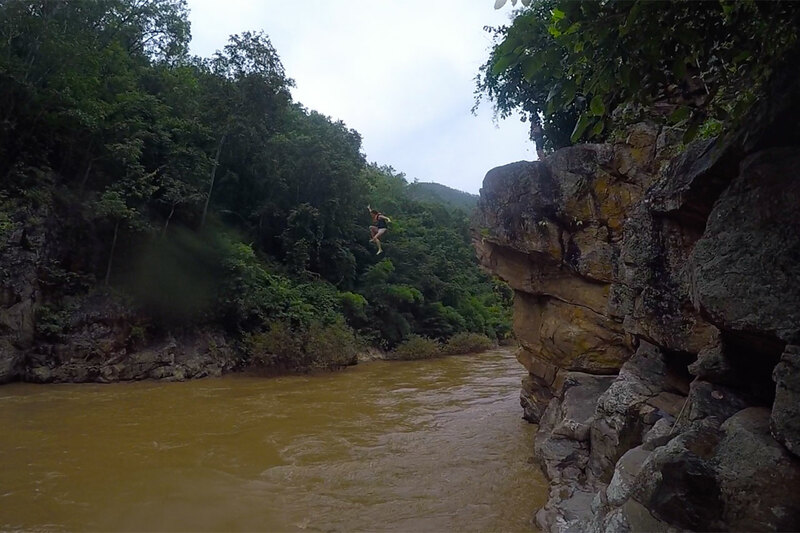 Once we reach the rock gorge we will stop for a 7-meter cliff jump for those who dare! There are a few more sets of rapids before we reach the flat farmland on the outskirts of Mae Hong Son. We will arrive at the Mae Hong Son Forestry Office where we take the boats out of the water. While the guides are loading up the gear you can take a shower and change in to dry clothes. We will drive about 1 hour to the village where you will be staying the night. Dinner will be prepared as you walk around and take in the village life style. While you eat dinner you can socialize with members of the guides family. You will need to pack 2 bags: 1 for rafting(take with you on rafting) and 1 for trekking(We will take it to village. The bags will wait for you there). Rafting bag: Swimwear, Water-shoes/Sandals/Flip flops, Sunscreen, Mosquito repellant, Toiletries,Towel, Dry clothes for camping, Dry clothes after rafting, Sweatshirt or jumper (Winter season). Trekking bag: Trekking shoes, Clothes for trekking, Raincoat (Raining Season), Toiletries. *We have limited space on the boat so we encourage you to pack small. **All your items will be stored in our dry bags throughout the adventure. *** Any extra gear you may have can be stored in our office under lock/key and CCTV. 2 people or family with young children (“IF” the water level is really high or the children are very young we have to send an extra guide to help paddle). This is for your safety when negotiating the Middle Pai. There would be an additional 1000 baht cost for the trip. For those that want to experience everything Pai Adventures has to offer we have put together the 2 day rafting and 2 day trekking adventure. 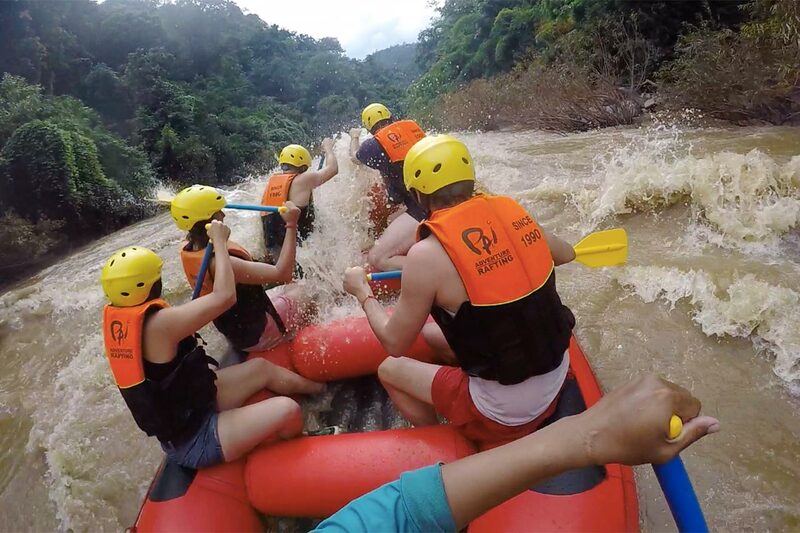 You will experience the complete rafting adventure, stay in a bamboo jungle camp, stay in an authentic hill-tribe village, and sleep in a tent in the jungle. 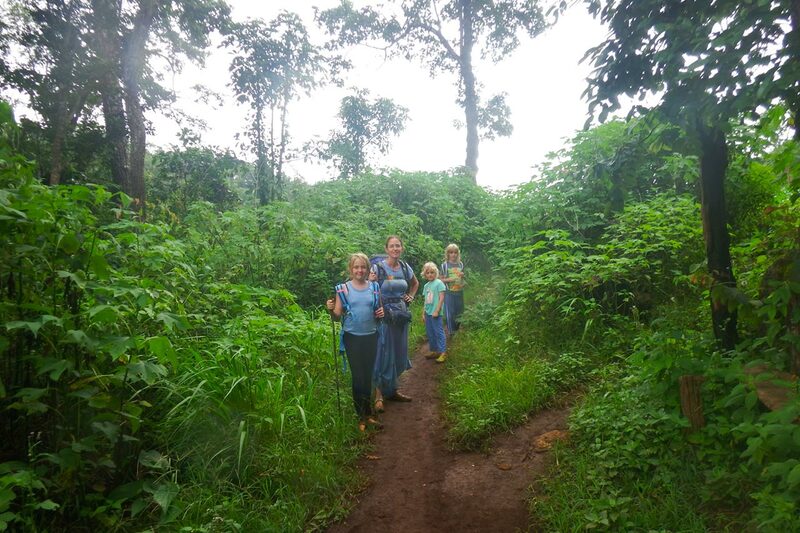 You will be trekking our Trek #2 and Trek #3 for this adventure. We will meet up at Pai Adventures office in the morning and depart shortly after. We will drive about 1 hour out of Pai through amazing farmland that meets up with the edge of the jungle. Alongside the river we will give a safety briefing and paddling instructions before we set off on the adventure. We will float through the lazy waters winding its way through the mountains. After a couple of hours we will find a spot to sit alongside the river and eat lunch. After lunch we will set of again and enjoy exciting rapids until we reach the path to our hidden waterfall. 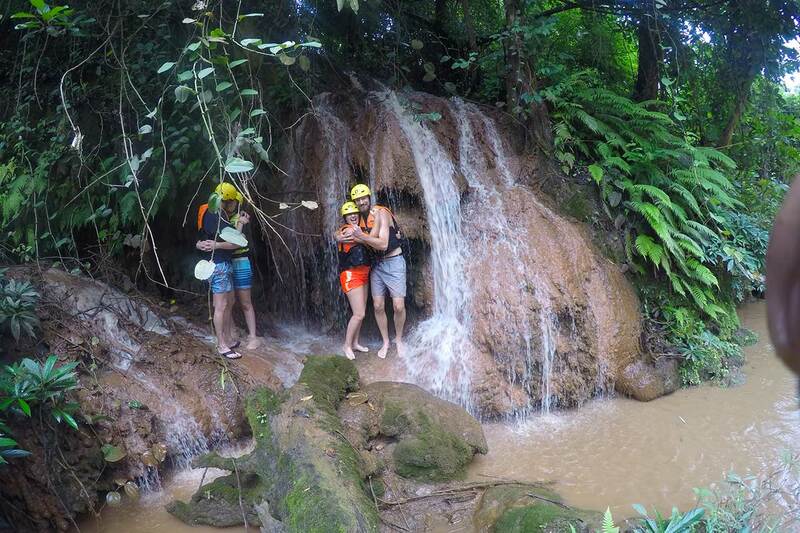 We will take you on a short trek to a pristine waterfall where you can enjoy a waterfall massage and soak in its pool. We will load back up in the boat and enjoy more rapids. We will stop off at the waterfall rock slide for some fun. 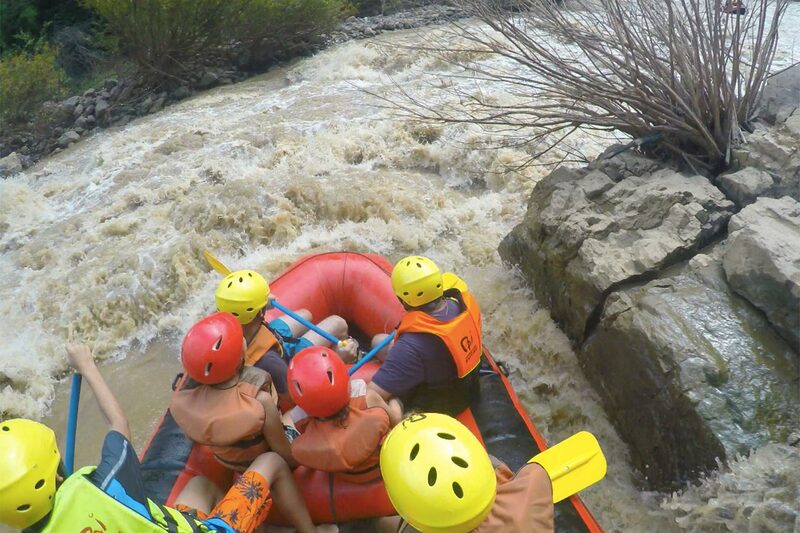 After everyone has slid down the rockslide a few times we will load back up and navigate some more rapids. We will then tie up the boats at our campsite location deep in the jungle. The guides may ask for your assistance in setting up the tents inside the bamboo structures. As you are drying off, changing clothes, and getting comfortable the guides will begin preparing dinner for the night. During and after dinner you can sit around the campfire and enjoy your amazing surroundings. You will be woken up by your guide who has breakfast waiting to be served. While you are enjoying breakfast the guide will begin breaking down camp. After you finish breakfast he will ask for your assistance in taking down the tent. After everything is packed away you will set off for more fun on the river. After a few sets of rapids we will hit a slower section until we reach the hot springs. There we will serve lunch. After lunch you will float through 15 sets of rapids up to class 3-4. Once we reach the rock gorge we will stop for a 7-meter cliff jump for those who dare! There are a few more sets of rapids before we reach the flat farmland on the outskirts of Mae Hong Son. We will arrive at the Mae Hong Son Forestry Office where we take the boats out of the water. While the guides are loading up the gear for the ride back to Pai you can take a shower and change in to dry clothes. Trekking bag: Trekking shoes, Clothes for trekking, Clothes for camping, Raincoat (Raining Season), Toiletries. 2 people or family with young children (“IF” the water level is really high or the children are very young we “MAY” have to send an extra guide to help paddle). This is for your safety when negotiating the Middle Pai. There would be an additional 1000 baht cost for the trip.